Lyme, AIDS, Morgellon’s Caused by GM “Toxic Wastes"
See no evil, hear no evil, speak no evil. But first do no evil. Allegory Press, LLC has released a provocative new book by Midwest author PJ Langhoff, "The Fourth Monkey: An Untold History of the Lyme Disease Epidemic." Langhoff's book contains evidence that Lyme disease, HIV/AIDS, Morgellon’s, and other infections including those with “no known cause” have important ties to genetic engineering "accidents" and toxic pollutants. 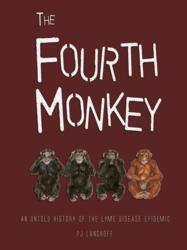 The Fourth Monkey reveals the “hidden” history of today's illnesses, and explains how they are linked to highly profitable industries. From contaminated waste waters and soils; to the implications of tainted vaccines and genetically modified (GM) microbes, insects, plants, and industrial biocides, Langhoff connects the dots in a logical, thorough manner. Learn how biotech tools are designed to reactivate sleeping viruses, and insects are transmitting "safe" lab-made formulas that are widely deployed by many industries. Examine a far less public side to infectious diseases and industrial and academic health that is negatively impacting millions around the world. Paperback and handheld books available at: http://www.Amazon.com and at the publisher, Allegory Press LLC.